This darling ballerina hippo stretches her arms in exuberance as she leaps into the air, her blue tulle skirt flaring around her. 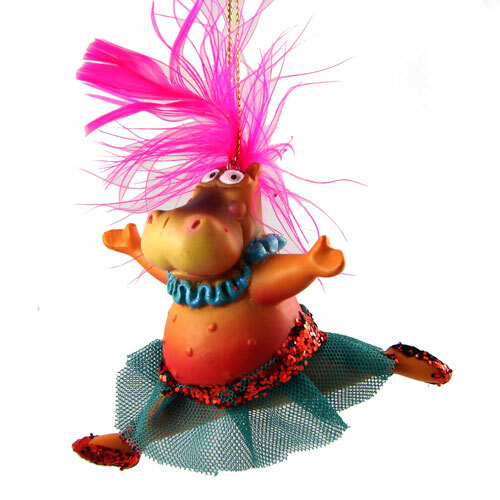 She makes a delightful gift for dancers or hippo collectors. Trying to order the Ballerina Hippo Ornament. Please let me know where I can purchase this item at! Where can I get this hippo or one like this. These are so hard to find! I was able to get some for the 2010 holiday season but I haven’t been able to find them this year. Please check back and if I get any more in, I’ll post it on the blog and on the Hippo Mojo Facebook page.